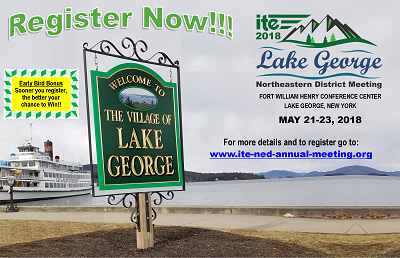 The ITE Northeastern District 2018 Annual Meeting will be held May 21-23 at the Fort William Henry Hotel & Conference Center in Lake George, NY. we would appreciate all registrations being turned in by April 15, 2018. All Hotel Rooms are $124 per night, Which includes luxury Fireplace and Jacuzzi rooms, but only while supplies last; first come, first serve. If you want the ultimate experience at this meeting, book your room as soon as possible and take advantage of this upgrade!!! See the Hotel Tab of the website for more details on how to book your room.